President Donald Trump greets Brazilian President Jair Bolsonaro during a news conference in the Rose Garden of the White House, March 19, 2019. The leaders of the Western Hemisphere's two largest economies are pledging closer trade ties and enhanced military cooperation, with U.S. President Donald Trump even suggesting Brazil should be able to join the North Atlantic Treaty Alliance (NATO). Trump said for that to happen, however, he would "have to talk to a lot of people." The U.S. president, at a joint news conference with Brazilian President Jair Bolsonaro, also pledged American support for Brazil to join the 36-member Organization for Cooperation and Economic Development (OECD), which includes most of the highly-developed economies. Bolsonaro, speaking in Portuguese, said his visit begins a new chapter of cooperation between Brazil and the United States, adding that with his recent election, "Brazil has a president who is not anti-American, which is unprecedented in recent decades." The retired military officer is known as the "Trump of the Tropics" for his far-right agenda of cracking down on crime and corruption, and nostalgia for Brazil's era of military dictatorship. The two leaders, who met for the first time Tuesday, also discussed their mutual support for Venezuelan opposition leader Juan Guaido, who has been recognized as Venezuela's legitimate leader by most Western countries, including the United States and Brazil. "All options are open," Trump reiterated when asked by a reporter in the White House Rose Garden if military intervention in Venezuela by the United States is possible. Trump noted that Washington has yet to apply really tough sanctions on Caracas, where Nicolas Maduro — who the U.S. president called "Cuba's puppet" — remains in power with the backing of Venezuela's military. In oil-rich Venezuela there is no food, water or air-conditioning, according to Trump, while Bolsonaro said "people are starving to death" there. "We need to put an end to this," Bolsonaro added. Just ahead of the meeting between the two leaders, the United States and Brazil signed an agreement to support American space launches from Brazil. The State Department says the pact will ensure the proper handling of sensitive U.S. technology consistent with U.S. nonproliferation policy, the Missile Technology Control, and U.S. export control laws and regulations. 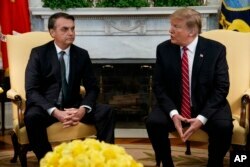 The two leaders "agreed to take the steps necessary to enable Brazil to participate in the Department of Homeland Security's Trusted Traveler Global Entry Program," according to a joint statement issued following the news conference. The two countries have never had particularly close relations, with Brazil traditionally wary of American influence in Latin America. But now their two leaders find themselves in sync on concerns about the Maduro regime in Venezuela, Cuba's involvement in that country, and the threat from China's rising influence on domestic politics in South and Central America. Until now, Brazilian diplomacy was a zero-sum kind of relationship, not aligned with U.S. interests and "sort of hostile in certain ways, at least at the bureaucratic level," former Assistant Secretary of State for Western Hemisphere Affairs Roger Noriega told VOA. "If we can find common ground with them on some key specific initiatives," the U.S. relationship with Brazil and South America, as a whole, can be realigned, according to Noriega, an American Enterprise Institute visiting fellow. VOA White House Correspondent Patsy Widakuswara and VOA's Jesusemen Oni contributed to this report.